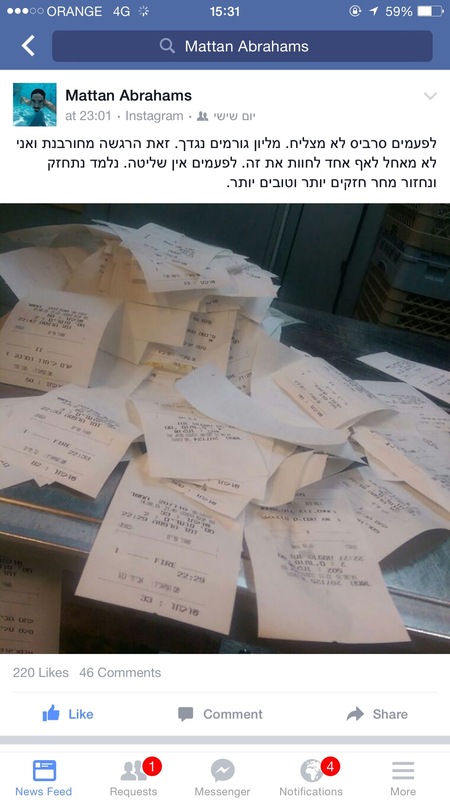 Sometime in the last few weeks, one of my favorite chefs—Matan Avraham of Hudson Restaurant in Tel Aviv —posted a few words about what transpired at his restaurant that day. From what he wrote, it was clear to me that he experienced a very difficult, and not so successful, evening. “Kitchen breakdown” is a process in which the kitchen is unable to keep pace with the number of new orders arriving from the floor: delays in providing customers their meals, leading to uncomfortable situations between wait staff and guests and to tension between waiters and the kitchen. Over time, tension develops between different sections of the restaurant staff, and can even lead to disquiet and discomfort for the restaurant as a whole. In a number of cases (in my case as well), the tension causes unhealthy energies in the kitchen and on the restaurant floor. A resolute kitchen manager and an experienced floor manager can channel these occasions and overcome them in peace by restoring peace amongst the staff, spoiling the customers with drinks and extra attention, and other processes learned from experience, but in actuality, no one wishes for such a moment to come to pass. I write this post for a few reasons. Firstly, every chef, whether a the less experienced or one with extensive experience managing services, should know that this happens—the chef at the bistro around the corner and the one at the highly rated restaurant at the top of the hill. It is important not to allow such events to lower the staff morale over time, especially given how much it hurts while it takes place, and especially since in many cases kitchen collapses can result in the staff feeling a sense of defeat. Reality, unfortunately, doesn’t always conform to the wishes of every chef and restaurateur, and sometimes the service loses control, but while you should draw conclusions from the experience,never look for someone to blame. -The arrival of guests at unanticipated times—either before or after their reservation (there are restaurants that refuse to seat guests who arrive a specific time interval later than their reservation, but this action still is not always implemented and unexperienced restaurants ). -Incorrect consideration / attention/ planing of the host in taking reservations or seating guests—in this case there are additional options for the restaurant manager and chef to direct the work and prepare for the rush. -Improperly constructed menus—as long as there is no congestion on the floor, food is prepared properly and in an organized manner, but as soon as a strain on the kitchen staff begins, the menu doesn’t pass the practical test. For example, courses requiring a lot of activity and hands in preparing them. -Technical issues—malfunctions with a grill, fryer, and any other relevant kitchen equipment, as well as improper assessments of kitchen staff, lack of staff, and improper decision making. The cocktail is built from two components, “fire” orders (or “working” orders) and unexpected customer flow. “Fire” orders are orders from a table that aren’t divided into appetizers (first courses) and main courses—the table orders everything at once. “Unexpected” customer flow is when improperly scheduled guests are seated for any reason, and generally the number of guests seated at a table is large (6 or more). When all the orders arrive at the kitchen at about the same time, and when they aren’t divided into courses, all are on “fire” (i.e. they are all “at work”), the chances are that severe, greater than average congestion will take place in the kitchen. Experienced chefs and restaurateurs usually know how to build a kitchen, menu, and staff that can deal with congestion, but sometimes they too experience such situations for reasons that are beyond their control, since the system relies on a number of dynamic parameters. I don’t know how many services I have managed in the last 24 years, but I can remember every bad service that led us to situations when the kitchen was unmanageable, the loss of morale and the feeling of defeat, regardless of the cause. Cooks and chefs rarely remember good service, but bad services are engraved, often deeply, in our memory. Again, it is important to remember that, most of the time, the collapse / break down is unexpected, but if it does happen, conclusions should be drawn, but things should be taken in proportion—we are part of a very complicated system, and at the end of the day, everyone wants it to succeed. Sometimes one screw coming loose is enough to cause the whole system to collapse. This post isn’t designed to give a solution, or to enlighten you—only to explain to those who have been burned in situations like these, that these happen to everyone—even the best and most experienced amongst us. At the end of the day, you just have to clean the kitchen and try to understand, draw conclusions, and open the door anew the next day. This entry was posted in kitchen, Uncategorized and tagged chefmichaelkatz, cooking, cooking experience, cooking schools, cooking tips, hard times in kitchen, kitchen team, learning to cook, learningtocook, stress in kitchen, tarining, tips for young chefs, trainingforchef, youngchef. Bookmark the permalink. Hello chef …thank you for all you do.. I can only say … I am am your student and I love it….. Thank you ever do much !!! Thanks chef! Reading that felt good. I really enjoyed this post thanks for share this awesome article. Very Interesting Blog, beautiful post thanks for sharing nice one for us.. keep it up man..